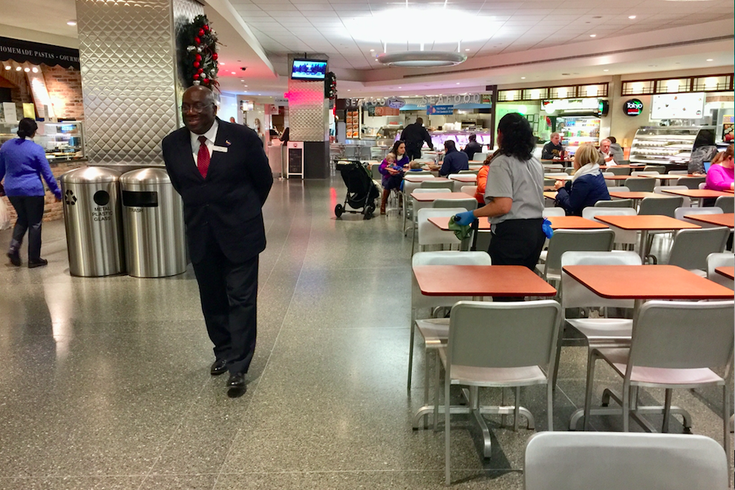 As he's done since the building opened in June 2008, John Holden makes the rounds of the Comcast Center's Market and Shops on Monday, December 18, 2017. He's 79 years old, but doesn't see himself retiring any time soon. The annual Holiday Spectacular had the Comcast Center's lobby packed with children and young-at-heart adults on Monday morning. Meanwhile, downstairs at The Market and Shops section of Philadelphia’s tallest (for now) building, John Holden was doing what he’s done every work day for the past decade: making people feel welcome. Inspired by last week’s story about the Center City doorman with a similar disposition, someone suggested PhillyVoice go meet the 79-year-old security guard. So that’s exactly what we did. It was a great tip since – in many ways – Holden is the skyline-landmark’s smiling face, with a grandfatherly ear and just a trace of an accent from the Virginia of his youth. Born in 1938 – August 28, to be exact – he traced his roots to Cape Charles and North Hampton, Virginia. He started the career that led him to the Comcast Center in bridge and tunnel construction. So, yes, he played a role in building the famed Chesapeake Bay Bridge-Tunnel, specifically installing those huge boulders designed to keep water from the thoroughfares. When he moved north, he settled in Asbury Park, N.J., where he worked as a Sears truck driver. Moving to Philadelphia was a good call, since it led to meeting Delores Scott-Holden. They got married in 1993 and, in the years since, have seen five daughters grow into adulthood. He’d been working as a salesman at Nick Balestra Jewelers before becoming a security guard. Twenty-four years later, that’s still his security professional trade with Allied Universal. “I settled in here (at Comcast Center when the building opened) about 10 years ago, so here I am,” he said Monday as he sat at a food court table in the building that opened in June 2008. He takes the bus from Willingboro, Burlington County – a 45-minute-to-an-hour commute – five days a week for his 9-to-5 shift as a security guard and ambassador. “He’s the unofficial mayor,” said the woman who nominated him for a profile. It’s easy to see why that title stuck when police officers, employees and visitors alike greet him like a lifelong friend. Most people don’t want to keep working as they’re knocking on the door of their eighties. Holden isn’t most people, though. What he loves is how younger workers in the building – in their 20s and 30s – seemingly love to confide in him. He also loves fielding questions about the skyscraper from visitors, and has gathered more than enough information to provide answers, since he’s been there from the beginning. With a new tower opening up right next door, he’s not too worried about losing friends. It’s the same company. 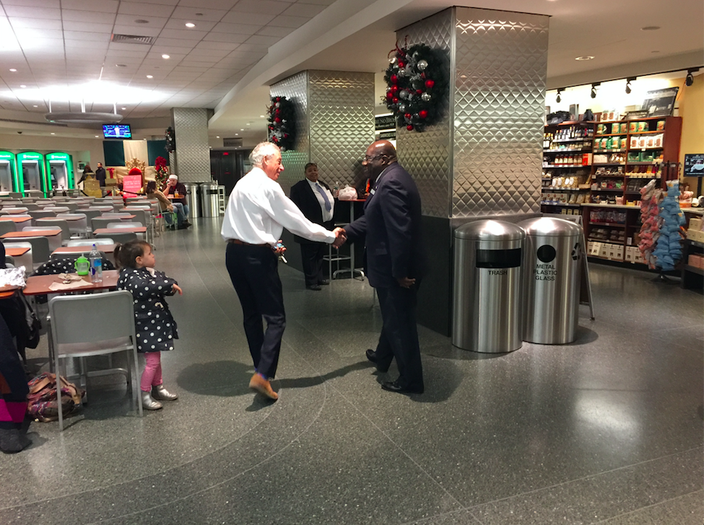 And even though he plans to stay put, he’ll see familiar faces making their way from Suburban Station and into the food court en route to the elevator. As could be expected, he does hear from disgruntled Comcast customers who “ask why their bill’s so high.” He can’t answer that sort of thing, though, so he directs them to people who can. “I get that all the time,” he said with a laugh. I asked him to share some of the crazier things he’s seen at 17th and Arch streets over the years. He laughed again before pinpointing the men’s restroom as the focal point for a number of tales bordering on crass. Run-ins like that lead to “rent-a-cop” chides, but he just laughs those off as well. “It’s been a good experience here, I can tell you that,” said Holden, who oversees three fellow guards and serves as shop steward with Service Employees International Union 32BJ. “I’ll keep working until I feel like I’m unable. I give all the credit to God. I don’t think he’s finished with me yet, so I’ll be here until whenever he said the time is over. Mailbag: How do the Sixers adjust rotation if Mike Scott can't play?